The majority of reef-building corals are found in tropical and subtropical waters. Click the image for a larger view. Reef-building corals are restricted in their geographic distribution by their physiology. For instance, reef-building corals cannot tolerate water temperatures below 18° Celsius (C). Many grow optimally in water temperatures between 23° and 29° C, but some can tolerate temperatures as high as 40° C for short periods. Most also require very saline (salty) water ranging from 32 to 42 parts per thousand, which must also be clear so that a maximum amount of light penetrates it. The corals’ requirement for high light also explains why most reef-building species are restricted to the euphotic zone, the region in the ocean where light penetrates to a depth of approximately 70 meters (Lalli and Parsons, 1995). As coral reefs grow, they establish characteristic biogeographic patterns. Click the image for a larger view. All three reef types—fringing, barrier and atoll—share similarities in their biogeographic profiles. 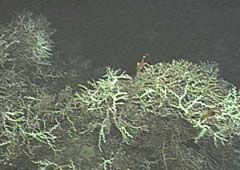 Bottom topography, depth, wave and current strength, light, temperature, and suspended sediments all act to create characteristic horizontal and vertical zones of corals, algae and other species. These zones vary according to the location and type of reef. The major divisions common to most reefs, as they move seaward from the shore, are the reef flat, reef crest or algal ridge, buttress zone, and seaward slope. How Do Stony Corals Grow? Where Are Coral Reefs Found?